A total of 15 BISC members – the same as last year – made up 23 free and dance entries in this year’s Bracknell Adult Open. They won a total of 12 medals – two gold, five silver and five bronze – which was also the same as last year but three more than the previous. The event, on June 24-25, once again ran very smoothly, thanks to competitions’ organiser Sue Truby and her team. But while Sue found time to enter seven classes last year, this time she restricted herself to competing in four … and won three medals. Gail Tudor competed in five events, including the group artistic with five others, and also won three medals, while six other club members entered more than one class. Rachel Jarvis, competing in her first Open, won gold in a compulsory dance class. Christine Piggott and Charles Wright won Bracknell’s other gold medal for original dance. The competition – the only one of its kind in Britain – attracted a record 204 entries (22 up on last year) in 39 classes by well over 100 skaters from as far as France as well as all parts of the UK. They included the incomparable Joy Shellard, now 76, who entered a solo artistic class, small group artistic and show number … and won three gold medals. Although her technical ability may not be quite what it was, she can still teach everyone a thing or two about presentation and she certainly understands what makes an artistic entry amusing, entertaining and hugely enjoyable. Her solo, Five Ages of Man, was superb as was Gosport’s small group artistic, Cabaret, which she skated with Peter Baker and Lesley Fryer. Bracknell once again put in a fine performance to win bronze in the small group artistic. 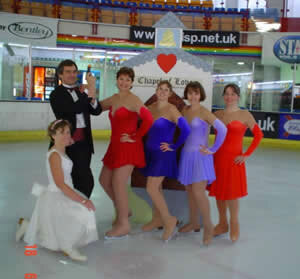 The Chapel of Love featured John Bailey as James Bond, Lesley Brenikov, Rachel Jarvis, Nicki Torrington and Gail Tudor as Bond girls and Lorraine Bailey as a bride. Since the age limit was reduced from 21 to 18 last year, the event is proving increasingly popular with younger adults who have skated since childhood. As well as giving a new lease on competitive skating life for some, it provides a chance to shine for those who did not do so well in Opens when they were younger. Caroline Sheppard, 19, who gave up competing three years ago and has since changed from concentrating on free skating to dance, was delighted to win a silver medal … and so was her grandfather, Roy Welham, who presented it to her! Victoria Squibb, who won a gold medal for free skating last year, this time won two bronze medals. In addition to the classes introduced last year, this year saw the start of an artistic class for two skaters. Known as the Redman Trophy, it was donated by friends of John and Jackie Redman from Streatham who were renowned for many years for their pairs skating. This year also saw the return of interpretive classes which differ from artistic in that props must be worn or held and the emphasis is on movement to interpret the music. These were replaced last year by improvisation classes which have continued. There were also three new dance classes – all original dance for couples – plus a new lower level free dance for which the Unpolished Trophy was donated by Hana and Brian Connor from Alexandra Palace… and won by them! small group artistic: John Bailey, Lorraine Bailey, Lesley Brenikov, Rachel Jarvis, Nicki Torrington and Gail Tudor, 3rd of 6.
original dance, under Level 5: Christine Piggott and Charles Wright, 1st of 1.